When I came to the faith, I don’t think there was a single Sunday during those first six months that didn’t weep in church. My tears spoke of a deep conviction and gratitude that I, a sinner, was accepted and adopted into God’s family. I was humbled because His amazing grace made me an heir to His kingdom alongside my Savior, though I had done nothing to deserve it. Over several years, this journey has taken me on a process of letting go – of preconceived notions, of things I used to hold valuable, of people whose opinions I used to hold sacred, of control of the way and timing of the shape of my life. However, the most difficult thing to let go has been my past sin. As I come to know the heart of my God and focus on Him, the process of my own release is like looking into a rear view mirror. Two things occur. The first is, as I set my eyes on what is directly before me, those things in the mirror become smaller over time. I become less concerned with them. I recognize that they must be put in the past if I am to be in the present with God. Second, as I continue to humbly walk with God, He meets me where I am with love, grace and mercy, and propels me forward, which further reduces my attention on the past. Friends, we are all EGRs. It’s the reason God sent His only Son, that whoever believes in him wouldn’t be lost but have eternal life. Whoever means you and me. Please don’t make the mistake of thinking this is written for someone else. It’s written for all of us. We are all sinners. We all need God’s grace and mercy. We all need to let go, open our hearts and let Him teach us. If Christ can be humble, so can we. Thank you so much, Mel, and thank you for visiting. I know whatcha mean. When I had first become a Christian, I had cried a whole lot too in church. Forgiveness and peace gained are such huge things! I like that, EGR! Thanks for that connection! My tears felt like they would never end back then. Now, I know it was the process of letting Him fill me. Bless you for your openness. EGR! I like that. That’s me to a t.
So true for all of us! Hi, Susan…EGR here! Were it not for the grace which God gifted us with through Christ Jesus, there would be no hope for humankind! Great post, going to RB it! Thank you, Steve. Amen to your comment! Bless you for your gracious and generous reblog. It actually helped to inspire my post for today…”Self” Defense! Have a super night, Susan! I’ve never of EGR’s before Susan, but I have heard plenty of ‘Christianeze’. which I find so patronising. You are so right, the Word applies to us all, as does God’s grace and mercy! As always, a great post that gets right to the core of what true Christianity really means. Thanks, Sherri. I think EGRs is an American thing, and patronizing it certainly is. I’ve heard too much of it, and it obstructs our view by focusing on the splinter and not the log. I hope you and the family are doing well. Love you! “Friends, we are all EGRs.” Amen! From start to finish. Good stuff. Thank you, Levi, for your thoughtful comment and the direction to Romans 8. It’s one of my favorites as well, full of beautiful reminders of the incredible gift we have in our relationship with Christ. Bless you. Thanks. I was sure that you knew Romans 8. I think EGR is an American term used not very gracefully. Just this morning, I took an erasable marker and wrote the word GRACE on my rearview mirror. It will be a constant reminder now everywhere I go to receive accept and give His grace. We should all learn Greek or Hebrew so we can get closer to the original meanings. Barring that, it is good to contemplate these words and let them speak to us. A very forthright and respectful as well as self-revealing post. Thank you for reminding me of to Whom we are to turn for solace in troubled times. Thank you, Beth. I’ve read these short verses so many times, and they speak to me in greater detail and in deeper ways every time I steep in them. I am thankful for God’s grace and love. 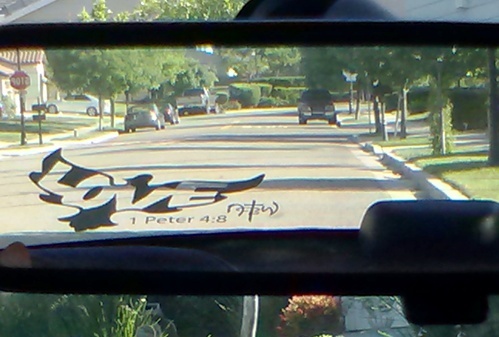 I think the rear view mirror analogy is a good one, but have you ever noticed those side mirrors that say, “Objects may appear larger than they seem…”….perhaps our sins overwhelm us to the point they feel unforgivable. How wonderful that God forgives those things that appear larger. He can handle anything if we would only let Him. That’s an excellent analogy, too, and I’ve been there! And yes, the key is to allow Him in to do His great work. We so often stand in the way of our own progress and His grace. That you for this thoughtful addition, sweet friend. I am rolling that rearview mirror image around and around – “squeezing the juice” – and squeezing some more. What a great way to make this “leave it behind you” so now and real! Whoa – just got a front seat passenger! Windows down – more stuff chucked out! Even more stuff on the road disappearing behind me. Whoa – He is playing with the wipers …. messing with the radio … 🙂 Thank you!! This is fun!! Amen to that! He listens even when we forget He’s right beside us. Thanks so much for your comment, Susan. We are all EGR’s! I like that because it’s so true. We all need God’s grace. There is no one who is in a better off position or a worse of position. We are all in desperate need of His grace! Great post…. The analogy of the mirror really touched a cord inside my heart today. but as my faith has gained strength and conviction, I have noticed the grip they have on my life is getting weaker. That is why the mirror touched such a powerful cord today, It was the perfect visualization to describe the changes I have been feeling in my heart. I love your writing. Thanks for being such a blessing to me. You’re so welcome. I’ve noticed for me that some past sins appear farther away than others. Others recede much more slowly, or seem to return around a new corner. Only with His help and continual mercy am I able to have a difference perspective. I rely on His eyes greatly to keep them in the past and out of that “shame and guilt” box in my brain. Knowing those thoughts and feelings are not from Him restores me greatly. A beautiful post, Susan. Sometimes forgiving ourselves is as great or greater a challenge than forgiving others. I also prefer “humble for this Beatitude over the word “meek,” but I’m afraid I haven’t the expertise to authoritatively state that it’s a better translation of the original. The Greek word used for meek is “praeis,” which means gentleness of spirit, or humility. That’s why I used the word humble. Thanks for asking. I should have put this in the post!